My dear hubby bought me a great book recently. It is called Praying in Color: Drawing A New Path to God. It was written by Sybil MacBeth. There is also a Kids’ Edition. She talks about how she has difficulty focusing during prayer and how she discovered that this was effective for her. Then she writes about why and how it works. She has little tips throughout as well. The kids’ edition is a short, quick version of the original book. I am generally overwhelmed by “deep” books at first. I much prefer the light reading of fiction. I am not sure why, but I generally have to take time before I decide to read something that makes me think. Chris bought both books for me and the kids. The longer one was intimidating, so I started with the kids’ edition. I read a few short chapters but then I started getting excited about the concept and switched. The kids’ edition broke the ice for me. I would highly recommend these books if you are like either the author or me. I have a terrible time focusing. My mind, my hands, my body all want to move and move on. Thought after thought flood my mind when I try to pray. 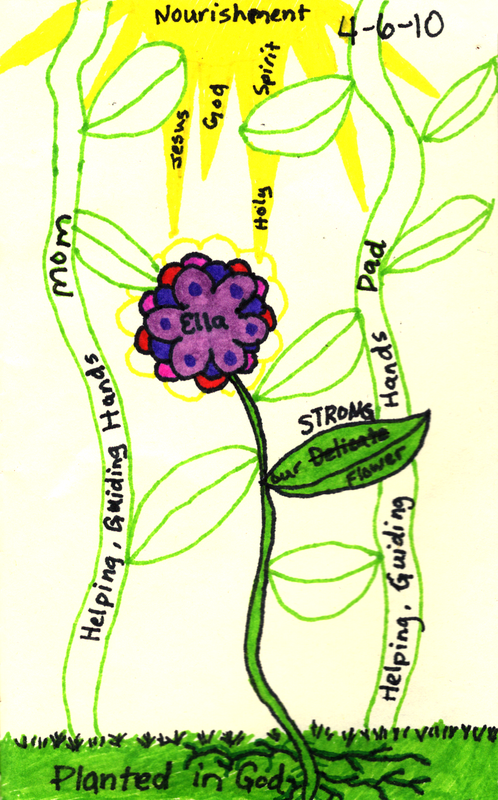 This way of praying is great for me because it’s just doodling! You don’t even have to think words, much less write or say them. You just focus on the person or whatever it is you are praying for and let your hand run wild. I do this same thing all the time when I am on the phone. I doodle all the time! You can pray whatever kind of prayer you want. She even goes over how to use this method for lectio divina. I have prayed for myself, but I have also interceded for others, tried a little lectio divina and done a combination. The doodles are just that and don’t have to be prefect. They aren’t supposed to be. However, if you are like me, you will think your prayers are the most beautiful works of art you’ve seen when you are done with them. Here is a prayer for my daughter. She is having some difficulty with school again. I think the troubles are both because she does have her own will, but also because she seems to be having self-esteem issues and other things that stem from that. I know that with God’s guidance she will pull through her difficulties, but she has really been on my heart and mind lately. I’ve also been reading another book lately that talks about saying blessings over people, so that is why I changed delicate to strong on the leaf. This particular prayer is more polished than most are, but it was just right that day! Oh! And in case you wondered, the supplies I use are a Moleskine Pocket Sketchbook (I am currently using a Moleskine Cahier Plain Notebook because Chris had one when I started, but I will switch when that runs out. The marker goes through the tiniest bit, but won’t on the Sketchbook.) I use Sharpie Ultra-Fine-Point Permanent Markers. I bought the pack that is linked at Wal-Mart for 15 or 20 dollars. It was a bit spendy, but for this purpose, well worth top-notch supplies. I hope this post will encourage someone to get the book and try this method of prayer out. I have been really enjoying it the last couple of weeks. 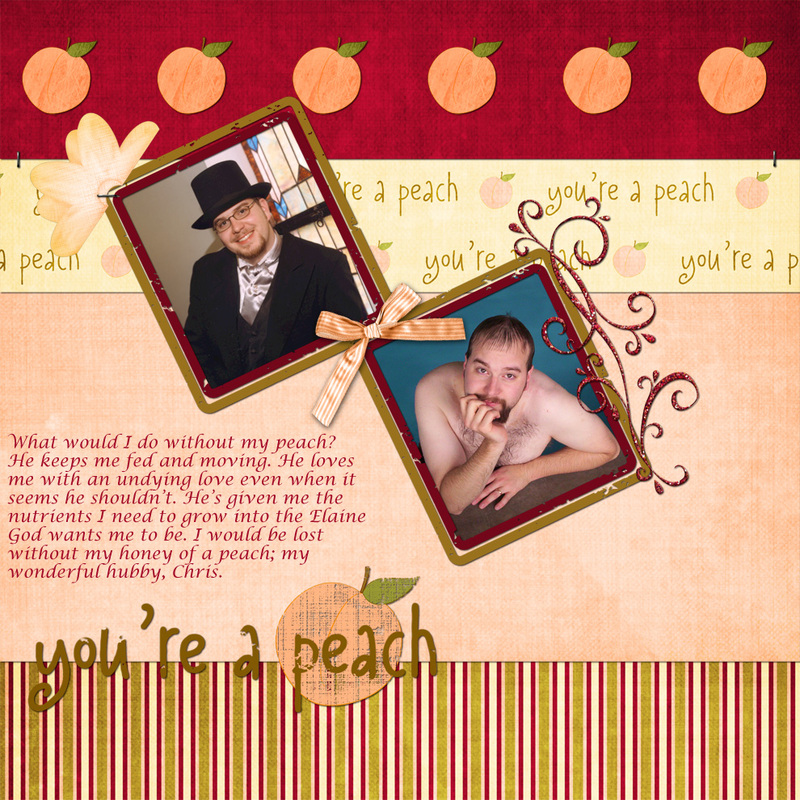 Click the image to see it enlarged and read the journaling. The other day we went to a church supply store. It was a Catholic store. They had all kinds of rosaries. I’ve mentioned before how my husband prays the rosary(without the Hail Marys). Well, after seeing daddy pray with his so much, Princess, who always wants to be just like daddy, wanted a rosary she saw that was made for kids. It’s got wooden beads and each decade is a different color. 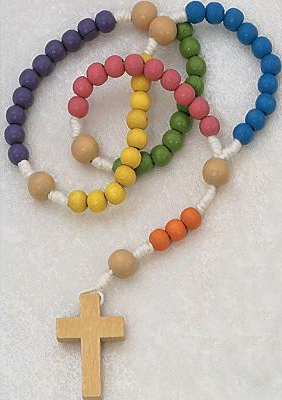 It’s a Wooden Kiddee Rosary. Well, daddy was telling her how she can use it. He told her to pray The Lord’s Prayer on the brown beads between the decades and to pray something like, “I love you, Jesus” on the colorful beads. She was so cute praying after that. First she complained because we always pray The Lord’s Prayer at night and it wasn’t dark yet, so she couldn’t pray that yet. We told her otherwise, but she wouldn’t believe us for like a whole day! 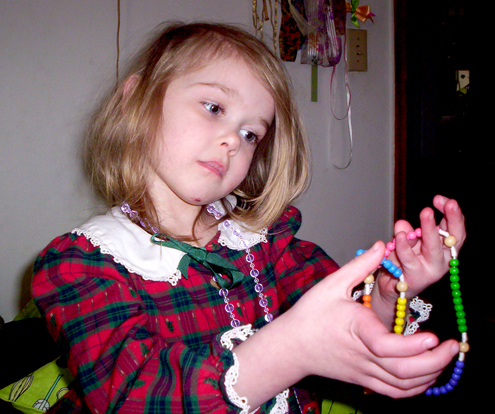 On the colorful beads she started by saying, “Jesus, you love me.” It was so cute! I’m glad God knows what in our hearts. That was music to his ears, I’m sure. Then she started saying a prayer that she made up, but she wanted it to rhyme, so it was mostly made up words. We were trying so hard not to laugh at how cute she was! Once again, God knew what she meant. It was adorable and touching at the same time. She must have been making God so happy with her nonsense prayer! It’s really a blessing as a parent to see your kids growing in God! (Friend’s questions in dark orange): I read your blog and also your sermon from Jan. 4th. 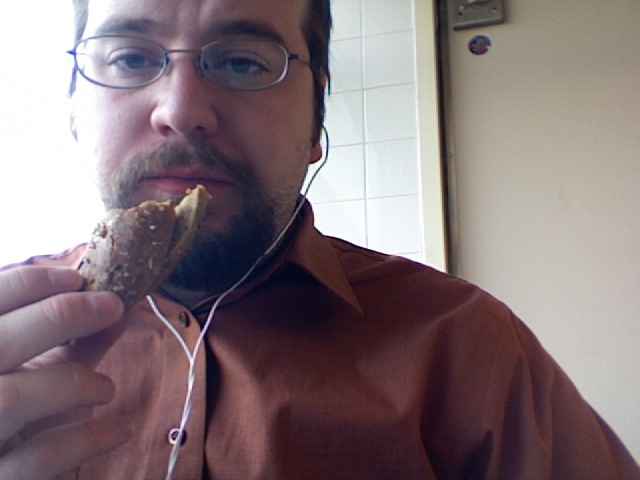 It was good….a lot of good points and thoughts! I enjoyed reading it. (My answers in green) Thank you! I read your blog from yesterday….you raised several questions for me. You said you and Chris are very competitive …So, I have several questions for you. Why did you get your ministerial license?I did it because while I didn’t plan to, I felt God leading me that way at the time. I guess I always felt called to be a pastor’s wife, but it seems that God is transforming me slowly into more than that. I could never have done it if I didn’t feel it was right. I am too lazy to go to all that work if I’m not sure I have to. I really don’t enjoy preaching at ALL! But, I know that is where I ‘m supposed to be right now. I hope I will grow to love it. I do love being in ministry and doing more than the average wife. I enjoy voting and having a say in what happens in the AG, too. Also, I have filled in for my mom’s church which is something that I consider my own ministry. I mean I wouldn’t have done it if I was riding on the heels of my husband. Do you have your own call from God to preach or did you do it because Chris did?I guess I skipped ahead and answered that already, huh? :)Would you be in ministry even if you weren’t married to a preacher? 3 years ago, I would have said… “I don’t know”. Now, if Chris died, I would continue at this church as their pastor if they let me (and I believe they would). So, yes, I would. Absolutely. How would going back to school effect your ministry and those who you are currently serving? Good question, I guess I think the biggest help would be long term in that even though it’s a small church, we would have a better chance of staying here if I had alternative income as well as what we both make preaching. As far as the effect of the extra time, I am truly unsure. But, if it’s what God wants, that will work out. As far as a greater Theological Degree, do you really need that for God to use you in the capacity that he has chosen to use you in? You can always read and study yourself to improve in your Theological studies. Now if you felt lead to teach in a college setting etc., then yes you would need the further studies and degrees. Very true, I am just trying to reconcile my two halves I guess. Other questions to ask yourself as far as returning to school for your Graphics Degree are…How would you use your degree and what jobs are available in your area to use your degree? I believe that I would be able to find something. When I first moved here was when I applied for the job that I wrote about. I could always work at a paper and they are everywhere. I would use my degree to pay off our huge loans that we already have from Bible college that we haven’t been able to even touch with our current salary. But I really feel called to do graphic design for church plants or other small churches that can’t afford to pay a graphic designer. Churches that could greatly benefit from a face-lift to the community so to speak. I want to be able to this for them at cost or on a sliding scale fee system. Very cheaply at least. If your interests are really in photography, why waste money on a design graphics degree. Wouldn’t it be better to put that money towards something you really love, photography classes and equipment? That is what I am considering at the moment, but I think your questions have made me realize the answer. The photography would be loads of fun, but it wouldn’t get me the rest of the training I need in order to do what I really want – cheap design for small churches. Can you afford to return to school without it putting to much financial strain on your marriage? Um…I can’t afford it without more loans, but we have so many already that getting the training to actually get a real job would actually be putting us ahead. If I start in the fall, it would defer my undergrad loans till I’m done and could get a job and hopefully finally make some progress on all our loans. I know it’s not the best plan, but I don’t see any other way of getting out of where we are. We just don’t get paid enough. I pray our church will grow, but I must be patient. All things in God’s time. Maybe this waiting time is the right time to take the action needed for me to be comfortable and confident with my skills. Also write out the pros and cons of how going back to school would effect your family time and time spent with your children, church time, personal time. When would you do your classes, projects and work outside the home? Would the greater stress be more harmful to you emotionally right now with the depression? or would it be your escape? Yes, very good things to do. I think that it would be helpful to be going somewhere. It would be added stress as well, though. I have to figure out which would be better. These last questions are great ones to pray over. Just some things to really think about and talk out with your hubby. I know I have raised more questions than I have given any answers for, but they are things that you need to figure out before you make any decisions that effect your whole family. I appreciate your thoughtful and thorough response more than you can know. Thank you. It was so funny to read your post today as I just finished praying for you gals struggling with depression and low self esteem. Praying that God would make Himself very real to you, that you can see yourself as Christ sees you and that you would be encouraged in some way today by Him. My heart feels for you all as you struggle with these issues on a daily basis. You all have giftings and callings that God has placed within each of you and I know Satan is out to destroy what God has placed within you. Don’t let him! If you have never taken a Spiritual Inventory Test I encourage you to take one. If you don’t know where to go email me and I can point you to a good one. It is a place to start to see where your strengths are at and also what areas you can work on strengthening. If you are doing things outside of your giftings it will be a constant struggle for you. If you have the gift of helps but find you are constantly stuck in a teaching position within the church body it will be a struggle for you or visa-versa. Find your niche, where your strengths are and let God use you there first. Then let him help you grow in these other areas. Great advice! I have taken several of those tests, but I bet now would be a great time to retake one and go over the results again. I pray that some how this posting encourages you. God does want you to walk in victory….that doesn’t mean you won’t have days that you struggle, but He will help you overcome! Thanks again to my friend and her encouraging and thoughtful words, challenging questions and above all the prayers! Well, the hubby came home on time and in time. I was coming down with a cold and I hung on till he got home, but then I kinda crashed. I’ve been sick all week. I feel draggy and groggy. That is why I haven’t been blogging. I didn’t feel like doing anything social at all. I’m on the mending end of things now, but still am rather out of it. Each level of the game you have to try to pop more of the bubbles by choosing one bubble to start the process. I was hoping to be able to put the game in this post, but I didn’t find a site that offered that as an option, so you will have to be satisfied with a link. This is a link to the game on a free game site. I also added a Facebook link. I have no idea if it will actually work for you or not. Enjoy! I miss my hubby! Come home, hubby! I just had to get that off of my chest. Sorry. Well, this morning went pretty well. Princess did the announcements for me, so I wasn’t completely a one-woman show. I need more practice running the service. Maybe I should tell Hubby that. Oh, wait, I think I just did! The worst part was worship. I just don’t know what to do up there. I feel awkward. I know it would make most sense to just worship, but then I get some words wrong and get embarrassed. I need to work on that, too, I guess. Someone told me I have a beautiful voice. Many people have said that, actually, but I never believe them. I suppose that they can tell better than I can, but my voice isn’t consistent. I could use some voice lessons, then I would probably feel comfortable singing. I always tell people I don’t sing, but it’s just because of all that. Overall, a very good service. And I was pleased with the sermon. I anointed two people with oil. It may seem strange, but that may have been my first time. I even felt comfortable praying in front of everyone today. God definitely gave me extra courage and strength today. I think it may have helped to know that Chris wasn’t there to help, so I had no choice but to do it. And if I was going to do it, I was going to do it my very best. God was definitely using me, I couldn’t have done it without Him. Thanks, God! And thanks to all who wrote encouraging words and sent a hilarious song to me last night. You all cheered my lonesome heart, greatly. Well, tonight I still have a Bible study to do, but then the rest of the week will be just doing my best to keep a happy household while Hubby is gone. We’ve been playing Scrabulous on Facebook more often since he’s been gone. It’s been fun. I look forward to the rest of the week. Now, I’m off to feed some friends’ cats. They are visiting family and we (me and the kids) have charge of their cats.